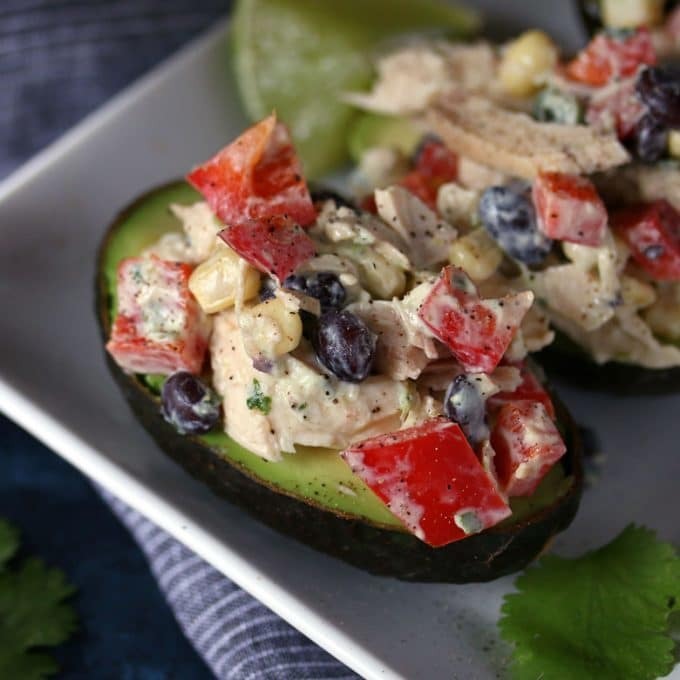 This southwest chicken salad stuffed avocado recipe is perfect for dinners or lunches! Use rotisserie chicken to quickly whip up this healthy meal. This post is in collaboration with Peapod. All thoughts and opinions are my own. Thank you for supporting our sponsors! One of my New Year’s resolutions was to eat healthier and I didn’t start off that well. I ate a lot of nachos the first week or two but I’ve been eating better the last few weeks. I’ve been eating more avocados – they are soooo good for you! For the longest time, I couldn’t stand avocados but I finally got over that and I want to eat them all of the time. I’ve also been eating more vegetables. I’ve come a long way in two weeks since my New Year’s nacho phase. Luckily for me, Peapod has so many vegetables and I can have them all delivered right to my door! When I’m short on time and don’t want to wait in long lines at the store, I order groceries from Peapod. Peapod is the longest operating and the country’s leading Internet grocer. It was founded in 1989 and has delivered more than 40 million grocery orders. That’s a lot of groceries. I love ordering from my computer and have also used the Peapod mobile app. I ordered all of the groceries for this recipe the night before and was able to pick a delivery window the next day that was super convenient for me. Also, I knew I was going to be short on time so I ordered cooked rotisserie chicken breasts. Shredding them took next to no time and we were able to eat dinner in minutes. 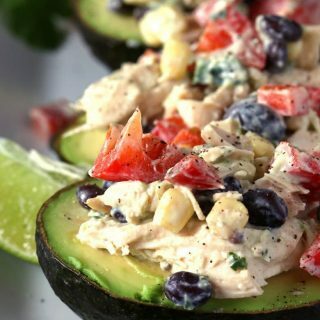 If you’re looking for something a little different for lunch or dinner, try this easy southwest chicken salad stuffed avocado recipe. It’s very easy to make and is perfect for those days when you’re short on time. Start by making the southwest chicken salad. I used some rotisserie chicken breasts so I could save time by not having to cook the chicken. You could use any cooked chicken however, including canned chicken. 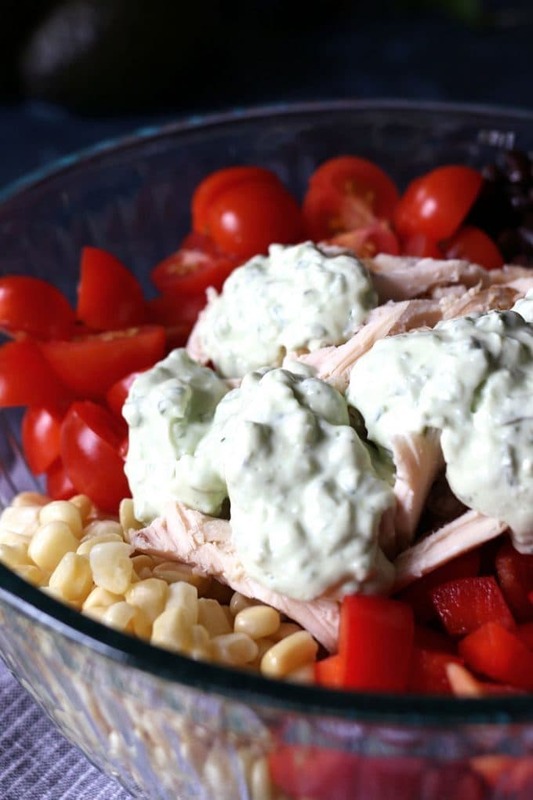 Combine all of the chicken salad ingredients in a medium bowl and pour the dressing on top. To make the cilantro poblano dressing, I combined those ingredients in a food processor and then added it to the bowl. It’s a thick dressing and recommend adding a little bit at a time. Some people like chicken salad with a lot of dressing and some don’t. Then cut your avocados in half and remove the pit. Spoon the southwest chicken salad on top – don’t worry about it looking pretty. It’s going to be a little messy and that’s ok. Sprinkle some salt and pepper on top and grab a fork. Eat the salad with the avocados and it’s the easiest meal you could possible make. 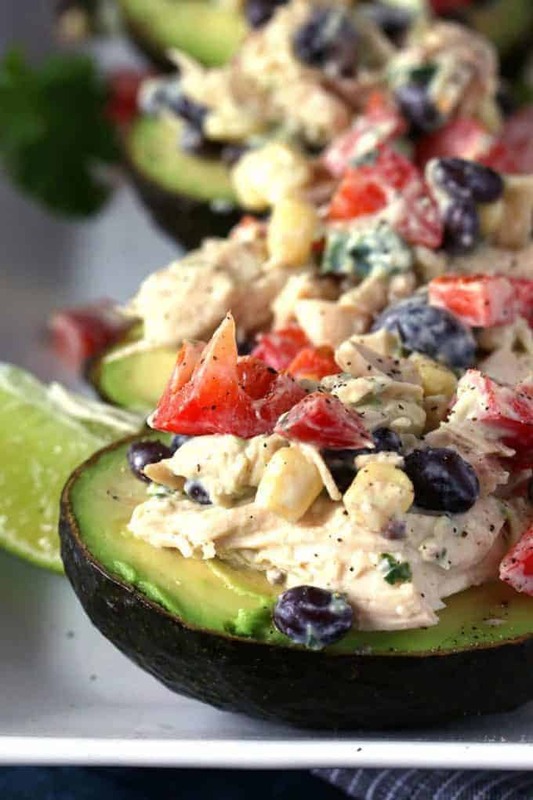 There will probably be a little southwest chicken salad left – you could use it to make a stuffed avocado on another day. Or, if you are a fan of lettuce wraps, you could swap out the avocado for some crisp lettuce. Bread is an option as well if that’s more to your liking. In a medium bowl, combine the chicken, red bell pepper, cherry tomatoes, corn and black beans. 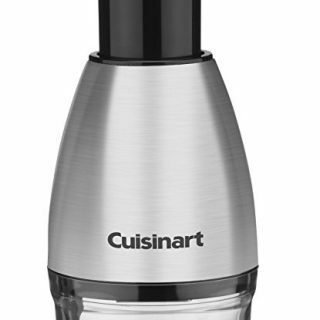 In a food processor, combine the poblano pepper, cilantro, greek yogurt, lime juice, olive oil and salt and pepper. Pulse until well combined, then add to bowl with chicken. Mix well. Cut your avocados in half and remove the pit. 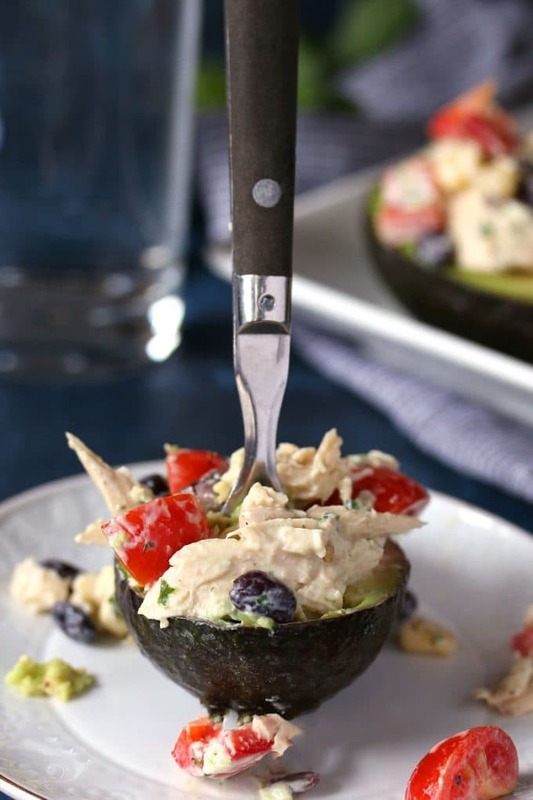 Spoon the chicken salad on top of the avocados and serve. Refrigerate any leftovers. This recipe makes a large portion of chicken salad. Consider halving the recipe if you want a smaller portion. Looking for more avocado recipes? I need to make this for lunch next week. I struggle with healthy lunch ideas, and this just sounds INCREDIBLE. Well done! Born and raised in Southern California, I love all things avocado! Love the idea of stuffed avocado! I could eat this for lunch DAILY! 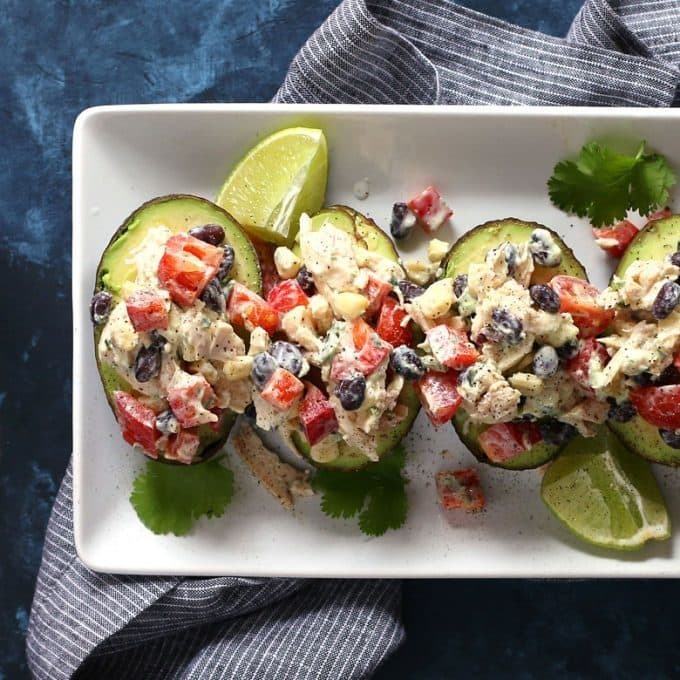 I am loving the stuffed avocado recipes! This would make a great lunch! I am absolutely in love with these beauties!